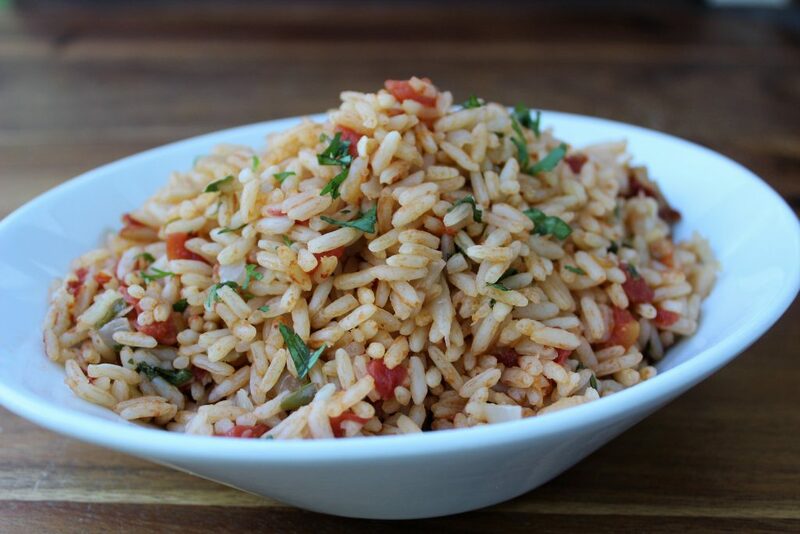 I make this rice whenever Tex-Mex is on the menu at my house. It’s my version of the tomato based rice found in Mexican restaurants across the country. I basically modified Mexican rice to suit my taste. I’m not too keen on the saucy red rice; I prefer a more mellow flavor to my rice. I cut back on the tomatoes for this recipe, but feel free to add as much tomato as you like, just be sure to adjust the amount of chicken stock accordingly. Serve this rice as a side to tacos, burritos, enchiladas, or my personal favorite, slow-roasted pork. Heat the chicken stock in a medium saucepan over medium heat. While the stock is warming up, heat the oil a large saucepan on medium high heat. Add the rice and cook until light golden, about 6 minutes, stirring frequently. Add the onion, jalapeno, and garlic, and cook until fragrant, about 2 minutes, stirring constantly. Stir in the tomatoes, chicken stock, and salt. Increase the heat to medium-high and bring the rice to a boil. Reduce the heat to low, cover and cook until the water is absorbed and the rice is tender, about 15 minutes. Turn off the heat and allow the rice to sit, covered, for 10 minutes. Add the cilantro and lime juice, fluff with a fork, and serve. Let me know when you make this recipe. Take a picture and hashtag it #QUEENCITYKITCHEN on Instagram, Facebook and Twitter. I can’t wait to see what you post! 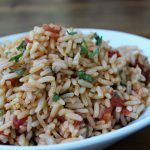 This entry was posted in Recipes, Rice and Grains, Side Dish, Tex-Mex and tagged chilies, cilantro, Mexican rice, rice pilaf, tomatoes on May 27, 2017 by Andria Gaskins.